So, this week I have decided to do reviews on a three of my favourite classic books. The first one I am going to do today is Jane Austen's "Pride and Prejudice". This is by far my favourite Jane Austen book and I find myself reading it over and over again. 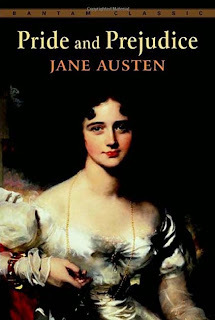 Jane Austen brings the reader into the world she grew up in and has a strong headed heroine, that loves to read and doesn't need a man to be happy. The quote that starts off the book is one of the most quoted book quotes. Elizabeth Bennet is a simple woman, who isn't seen in anyway rich. 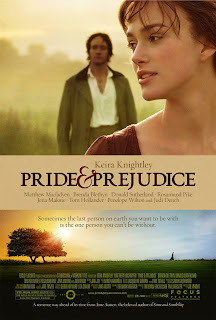 Her family is invited to a ball, where she meets the ever brooding Mr. Darcy. When she over hears a conversation with Darcy and his friend where Darcy calls her plain and starts talking about her family, she writes him off as basically a goody too shoes. Throughout the novel you become more familiar with what was expected of a woman back then and what she had to do to keep her family feed. Jane Austen was such a good writer that it is a shame none of her books were published with her name on them until after her death. Woman were supposed to find a husband and take care of the house, not write novels. It is also a shame that Jane didn't get to see the popularity of her works and how they are still talked about and read to this day. Some people say that she put her own personal experiences into her writing since all the characters in her stories find love and then lose it just to find it again. Although, Jane never married she was rumoured to fall in love with a man who married someone else. After her sister lost her fiancé and Jane got her heart broke, they made a vow to never get married, which they stuck to and lived out the remainder of their lives together.